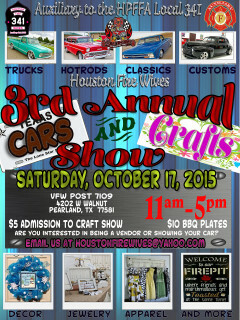 Houston Fire Wives will present The 3rd Annual Cars & Crafts Show, a craft show with 45+ vendors, outdoor kids area, BBQ plates and car show. Car show is free; $25 car entry fee for participants (cars, trucks and motorcycles). The Auxiliary to the HPFFA Local 341 is a group of individuals that wish to honor the sacrifices and commitment that our firefighters have made to our communities. We support their accomplishments, unite our families and serve our communities in effort to contribute to the betterment of all. We are here to assist the Local 341 whenever we are needed and are in the planning stages of restoring the 1950 auxiliary coffee truck. $5 (children under 15 are free).